Here's a stereotype I can't stand, Indian people are hot heads. What does that even mean? I will tell you something that is true - we do eat a lot of spicy food but not all the time as people perceive it to be. We also like spicing our breakfast up with items like corn flakes with masala or uttapam (Indian pancake). You know how pancakes are a popular breakfast or brunch item here in the States. 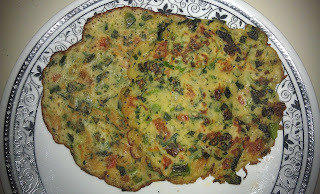 In South India, uttapams are a popular breakfast item. Pancakes and uttapams are similar in that they are both flatbreads except ours is savory. Traditional uttapams are made with a combination of urad dal and rice. 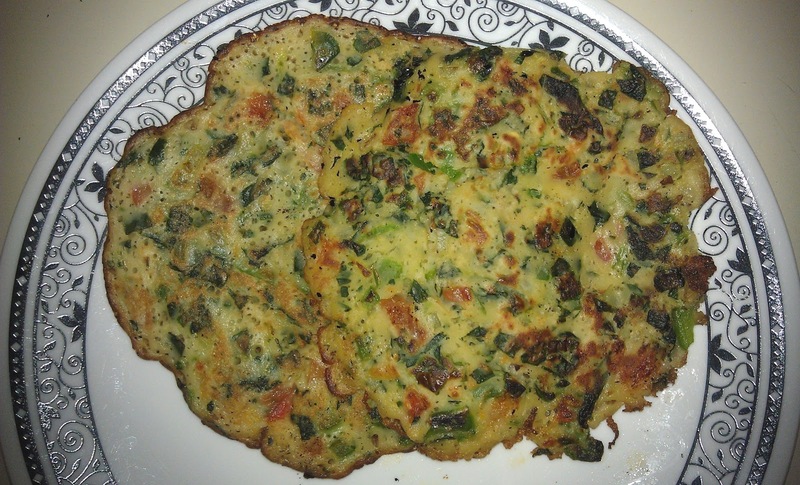 Since Urad dal is not available in regular grocery stores, we came up with an easier Uttapam recipe. This blog is called "Indian" Khana (food) Made Easy for a reason. This recipe makes about 10-12 pancakes or uttapams. Follow the instructions for making the pancake mix from the packet or box. 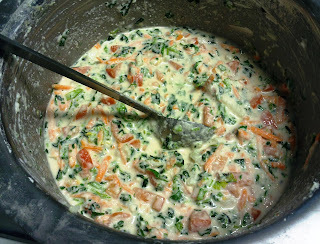 Add in all the chopped vegetables, salt and rice flour and mix well. Add an extra ¼ cup of water and mix to an uniform consistency. Heat a griddle on medium heat for few minutes. Sprinkle or spray cooking oil onto the griddle and when it's hot, pour in 2 ladles of the dough onto the griddle. Spread the dough out evenly in a skillet or electric griddle. Add a teaspoon of oil around the pancake and cover the griddle or skillet with a lid to cook evenly. Allow the pancake to cool and serve with your favorite chutney. - When using frozen vegetables, make sure to drain off the water before mixing into the batter. If the batter is runny, then the pancakes will come out soggy. - Also, for thicker pancakes, add 1/8 cup of rice flour. Another savory breakfast item that is really popular in South India is Guntapongalalu or Veggie Pops. Check it out! I know what you mean about hot food. Western people seem to think chilli is the main thing and not flavour, here in Britain at least.